The temperature is rising and spring is calling your name. What is it saying? It’s telling you to open your windows and start cleaning. Spring-cleaning is a common phrase used by many homeowners to describe the act of thoroughly cleaning their home in preparation for the warmer months ahead. It doesn’t mean simply sweeping and dusting. It means changing air filters, cleaning out closets, flipping mattresses, and taking on any space or area of your home that may be cluttered, dusty, or untouched for a period of time. Let’s face it, we often get lazy in the winter and forget about the little things like cleaning the oven or washing the baseboards. Follow this article for tips on how any DIYer can tackle spring-cleaning head-on this year. Start by cleaning the air of your home. Since winter is normally a time of little ventilation to keep the house warm, now is the time to start clearing out the old and bringing in the new. This means changing the air filters, switching your thermostat to fan on, and opening up the window to let fresh air cycle through your home. Good ventilation is the key to combating any indoor pollutants coming from your carpet and other household objects. It also helps with the removal of unwanted dust. While you’re cleaning out the air in your home, you can start on other tasks like cleaning out your closet. While minimalism is starting to become more popular, you don’t have to go all out and throw away everything. Just remember that it’s important to objectively look at your closet to remove anything you no longer wear or need, and store those thick sweaters until next winter and bring back the spaghetti straps. Make sure to keep a few coats handy, as weather always seems to do its own thing no matter what the weatherman says. Donate anything that no longer fits or sell your clothes at a second-hand store or local thrift shop. Not only are you cleaning, you’re also giving back! Once you find yourself organized and the air is clean, it’s time to get down and dirty. My rule of thumb is to always save floors for last. Therefore, go through each room of your home and begin cleaning all windows and surfaces, including the bathroom. You can make your own all-purpose cleaner by adding about 20 drops of tea tree oil and 10 drops of lemon extract or zest to 1 quart of water. Mix this up in a spray bottle and you have an all-natural cleaner that’s safe and effective for tile, countertops, and floors. 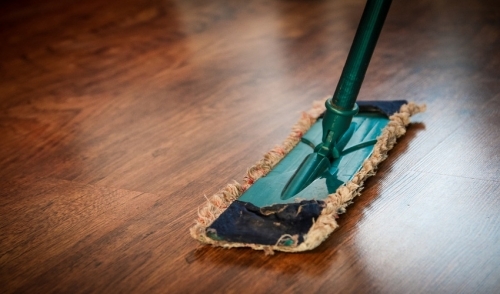 Once you have cleaned all the surfaces and household objects throughout your home, its time to take care of the floors. As you’re going through each room, don’t forget to remove any rugs that need to be cleaned outside and to rotate down comforters. Use baking soda on your carpet to deodorize and clean your floor. After 30 minutes, go through with a vacuum to remove the baking soda leaving your carpet clean and fresh.